David Ortiz’s vast baseball knowledge, discerning eyes, and flair for the moment made him the perfect candidate for a new role at The Topps Company. Topps, the exclusive trading card partner of Major League Baseball, is excited to announce Ortiz as a spokesperson and TOPPS NOW® lead scout. 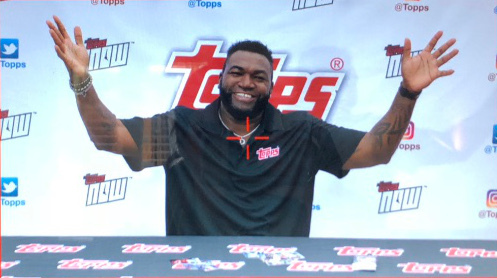 In this role, Ortiz will work with the Topps team in picking the best moments of the Major League Baseball season and support Topps’ initiatives throughout the year, including National Baseball Card Day. TOPPS NOW baseball cards, which are only available on Topps.com, celebrate the greatest moments and milestones from the MLB season, while giving baseball fans a chance to relive them for years to come. The physical cards are available to purchase the very next day through Topps.com, but for just 24 hours, and will not be available again. Only the number of cards ordered during that 24-hour window are printed. Ortiz was a perfect candidate for the TOPPS NOW lead scout. With his view of the game as one of the top sluggers in history, and baseball broadcast commentator, Ortiz has a way of seeing the game with a different lens. His love of baseball runs deep – and so do his friendships. He’s able to provide a bevy of insight that can’t be matched. Ortiz has had a number of prolific Topps baseball cards over the years, and he’s excited to showcase the cards for the next generation. He will take part in Topps’ outreach throughout the season, including National Baseball Card Day, which is held on the second Saturday in August. Topps baseball cards have depicted great moments and players throughout its storied history, and is the definitive place to get a star’s rookie card. TOPPS NOW has featured the Chicago Cubs and Houston Astros winning the World Series; Ichiro, Adrian Beltre and Albert Pujols getting their respective 3,000th career MLB hits; and rookie debuts, including Shohei Ohtani, Aaron Judge, Ronald Acuña Jr., and more. Founded in 1938, The Topps Company, Inc. is the preeminent creator and brand marketer of physical and digital sports cards, entertainment cards and collectibles, and distinctive confectionery products. Topps’ leading sports and entertainment products include Major League Baseball, Major League Soccer, UEFA Champions League, English Premier League, Bundesliga, Indian Premier League, Star Wars, WWE, UFC, Wacky Packages, Garbage Pail Kids, Mars Attacks and other trading cards, sticker album collections and collectibles. Topps’ app portfolio, including Topps BUNT®, Topps NFL HUDDLE®, TOPPS KICK® and Topps® Star Wars℠: Card Trader, has been a hit with millions of fans around the world. Topps’ confectionery brands include Ring Pop®, Push Pop®, Baby Bottle Pop®, Juicy Drop ® Pop, and Bazooka® bubble gum. Topps was acquired by Michael Eisner’s Tornante Company and Madison Dearborn Partners in October 2007. For additional information, visit Topps.com and Candymania.com.